As many of you know, today is the 45th Yom Yerushalayim / Jerusalem Day, the holiday that celebrates the reunification of Jerusalem in 1967 during the Six Day War. In celebration, I was asked to give a tour to a group of overseas students in a gap year program here in Jerusalem. They are studying for the year at the MMY Girls’ Seminary, and they are located in my neighborhood. So the tour was supposed to both focus on the subject of Yom Yerushalayim, but also to tell them more about the neighborhood they’ve spent the year in. I’ll briefly review the whole tour, but I want to really focus on our last stop, at the Tayelet, or Haas Promenade. I started out explaining that while we would be talking about the Battle for Jerusalem in 1967, I would be taking a broader approach to the holiday, seeing it as a time to celebrate Jerusalem overall. 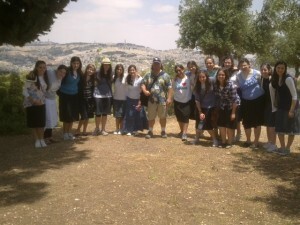 We started out walking through the Bakaa neighborhood to Yemin Moshe and Mishkenot Sha’ananim. On the way, I spoke briefly about Bakaa, the Ottoman train tracks coming from the Old Train Station, and the Khan Theater. At Mishkenot Sha’ananim, I spoke about the move outside the walls of the Old City, starting in 1860. This mini-neighborhood was the first baby step of a move that helped Jerusalem expand from the 1 square kilometer that is inside the Old City walls, to the 125 square kilometers that it encompasses today. I also told many of the famous stories of the neighborhood itself. Exiting the bottom of the neighborhood, we discussed the path of the Green Line that split Jerusalem between Israeli and Jordanian-controlled pieces, as well as the Jewish enclave on Mount Zion, on the Jordanian side of that line. I spoke about the cable car and tunnel that were alternately used to supply the people there. As we walked up Derech Hevron / Hebron Road, we stopped to see Yigal Tumarkin’s famous Peace Sculpture. From there we walked up past the Abu Tor neighborhood towards the Tayelet. I explained how Abu Tor became the mixed Arab and Jewish neighborhood that it is today, and also spoke about the fact that we were walking on the very same path where Abraham, Isaac and Jacob most likely walked. Continuing in towards the neighborhoods of North Talpiyot and Arnona, we turned towards the Tayelet just across from Allenby Camp. I spoke of the history of that spot, both before and after 1948. And then we walked the final stretch to the Tayelet itself. It was only in preparing for this tour that I realized how the Tayelet is one of the absolute best places to discuss the 1967 Battle for Jerusalem. And so, I wanted to make this one of the cornerstones of this short walking tour. For starters, from this wonderful viewpoint, one can see almost every important spot in the battle, except for the early battles on the north side of the Old City, at and near Ammunition Hill. But you can see Mount Scopus, the main objective for the paratrooper force that attacked Ammunition Hill, and from which one of the forces attacked the Augusta Victoria complex on the Mount of Olives. You can also clearly see Augusta Victoria itself. Furthermore, you get a very clear view of the Temple Mount, and the areas of the Western Wall, Lion’s Gate and (the poorly translated) Dung Gate, all of which were key spots in the battle. The topography of these areas is key to understanding both the difficulties of the battle, and the necessity of engaging in that battle. It is not just that viewpoint, however, that makes the Tayelet a great place to discuss the Battle for Jerusalem. It is also the physical location of the first real conflict of the campaign. When the war began, it was not clear that Jordan would be actively participating, despite their mutual defense pact with Egypt. When they fired the first few salvos of shells at Jerusalem and Tel Aviv, it was still unclear whether they would be truly engaged in combat or whether this was just a symbolic way of holding up their side of the defense pact. Israel in fact hoped they would not attack, and preferred just to fight in Sinai with one enemy, instead of two fights on two fronts. Thus, Jerusalem was not on the objectives at the start of the war. Israel even sent messages to Jordan explaining that if Jordan did not attack us, we would not attack Jordan. But these pleas were ignored, and it became obvious that Jordan was going to become a full-on combatant in the war when they stormed and took over the UN compound at the Governor’s Mansion in southeast Jerusalem. It is this very building that sits alongside the Haas Promenade today, and serves as the headquarters of UNTSO, the UN Truce Supervision Organization who is their watchdog in Jerusalem. Israel realized after this offensive that Jordan was serious and that they would need to counterattack. The paratroopers are the more famous of the heroic forces in the Battle for Jerusalem. But no less heroic was the less known group of older reservists, named the Jerusalem Brigade, who took part in the battle here. They advanced from the area of Allenby Camp where they were stationed, and advanced the few hundred meters to the Governor’s Mansion. Taking heavy losses along the way, they finally succeeding in conquering the mansion from the Jordanians. From there, they swung further south to capture the village of Sur Baher, thus gaining control of the road to Jerusalem’s south. On the succeeding days, they moved northwards, through Abu Tor and to the Old City, where they entered through the less glamorously named Dung Gate. With that victory, Jerusalem became a unified city once more, following a brief but tumultuous 20 years as a divided city. And the Old City and Temple Mount once again came under direct Jewish rule, the first time in over 1800 years that this was true. There are many great sites in Jerusalem to explore the battles of this war. The Tayelet is a less common one. But if the subject is something that interests you, consider a visit (with or without me) to make greater sense of it all. Yom Yerushalayim Sameach! Happy Yom Yerushalayim!